“Time to buy a riding law mower,” my brother-in-law announced when he first saw the place. Jeremy and I were pretty sure it was NOT time to buy a riding lawn mower. When we bought our first house (and its accompanying front and back lawns) in Alabama during graduate school, J sized up our small lot and came home with a manual push-mower capable of cutting grass at not one but two different lengths. “You don’t want a gas mower?” I asked. “Oh no, I hate those things.” So J headed out to the yard and came back 30 minutes (and 3 rows of grass) later, sweating profusely (because August, afternoon, Alabama) and said he’d finish in the morning. The next day, he bravely finished mowing the lawn, then promptly hired a gardener for twice-monthly mowing and edging. Yard care is simply not a J&J strength, okay? This time, we knew we’d be hiring a gardener. Once the most important boxes were opened and our various move helpers had returned home, Jeremy contacted a few local companies and hired a man to come twice-monthly–with, yes, a riding lawn mower–to trim the grass. Before the new gardener was able to make his first visit, I had begun to realize just how out-of-place our unkempt grass was to the neighborhood, and how short the grace period on unruly roughage might be. A elderly man with his own yard service pulled up one afternoon and explained, quite friendly-like, that he had taken care of our lawn back in the 1990’s. He didn’t want to do our lawn now, but he had some contacts who might be willing to take it on and he’d be happy to make some phone calls on our behalf. I thanked him and explained that the new gardener would be arriving shortly, and he seemed quite relieved on my behalf. “You have a very, uh…active HOA in this neighborhood,” he explained. “They take these things seriously.” And that seriously made me laugh. I’m almost relieved to find myself in an area where people have enough time and energy on their hands to take each other’s lawns seriously. Because we just left San Jose, where everyone’s too busy working 80+ hours/week then driving into their garages and heading straight inside each night to take much notice of their own yards, let alone anyone else’s. To make a ridiculously long post about lawns a little bit shorter, it took our new lawn man three hours with his tractor-like machine to do that first mow of our lawn, and five days later it looked overgrown again. Oops. We can hardly afford to pay for weekly+ lawn care, so Jeremy and I sucked it up and bought a lawn mower. It doesn’t require a license to operate, but it is more high-tech than our old push mower (which is probably still being passed between English grad students at UA). 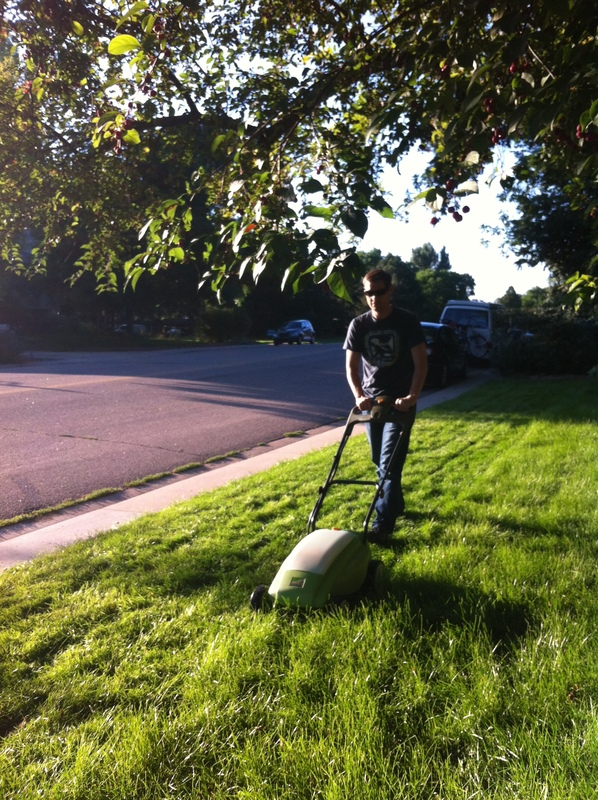 J testing out our new mower on the small side yard. Introducing the Neutron battery-powered mower, with 3 length settings. Taking turns, Jeremy and I mowed our lawn in about 45 minutes, which conveniently is also how long the battery lasted. How big is our lawn, exactly? Well, the house sits on the back of a 0.29 acre corner lot and the whole front property is grass. So, yes, a lot of lawn. (I sense a re-landscaping project in the future…). This entry was posted in Fort Collins, Outdoor living. Bookmark the permalink. Our new to us home in Vegas has a 13,000 sq ft back yard that was half grass. It was unruly until we stopped watering it because of a leak in the piping system that was literally costing us hundreds in our water bill. Now it is a bunch of patches of brown. Luckily, our HOA can’t see that part! 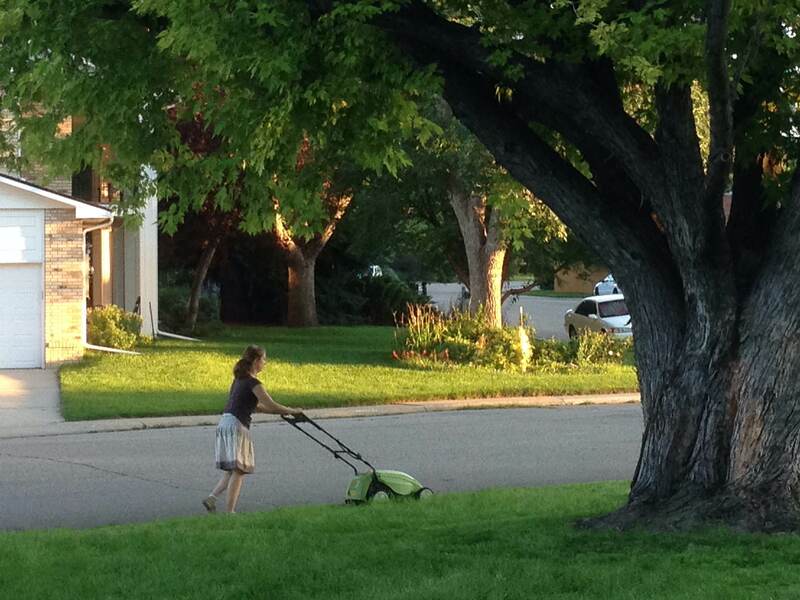 I love seeing you mow in a skirt. That’s my favorite.